With a name signifying “passion”, there is added pressure for Junoon to deliver elegant contemporary Indian cuisine. Since opening in 2010, Junoon has been awarded a Michelin Star. Yes, 7 years: not a small accomplishment for a cuisine that is sometimes misunderstood. It has been a while since we wanted to go, but the list of restaurants on my list being what it is, it was often postponed: I regret it. The food crafted by Executive Chef Akshay Bardhwaj being superb, creative and beautifully plated. It is served in a nice atmosphere where the only negative is the light: it is so dimmed you cannot eat with your eyes. But before I talk about the food, let’s talk about their cocktails: at Junoon, Mixologist Hemant Pathak created interesting combinations with herbs, spices and tea from Asia. But what was really funny is their “Game of Thrones” section that has cocktails like Arya Stark, Little Finger, Mother of Dragons or Jon Snow. 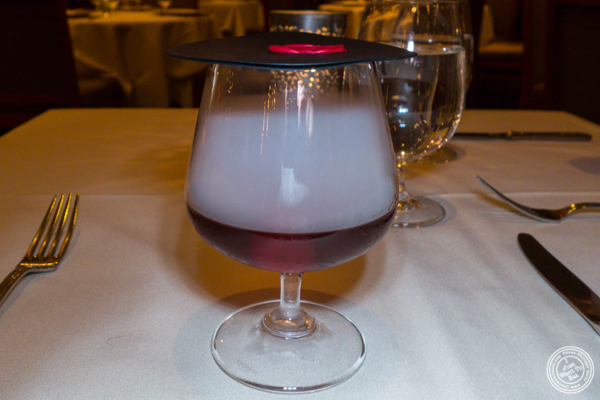 I decided to go for the latter that was made with Cognac, Ardberg 10 year old Scotch, Carpano Antica, crème de cacao à la vanille, bitters and a spiced smoke for an additional smokiness and for the show. This was delicious and a must have if you like whisky, smokey whisky. For the dinner, we decided to go for their 3 course meal that, for $75, is a good deal for this type of restaurant. Jodi started with the Lahsooni Gobi, a crispy cauliflower with a tomato, garlic and chili chutney. On my side, I chose the tandoori octopus as I did not think I saw octopus on an Indian menu before, and thought it would be interesting. It was served with arugula, almond and a mango vinaigrette. It was really good, although at the beginning I thought that the octopus was too soft; but, the almonds added the required texture. I also liked the mango vinaigrette that gave a nice fruitiness to the dish. With our appetizers came three chutneys: pineapple, bok choy kimchi (my favorite, a bit spicy) and spicy tomato. 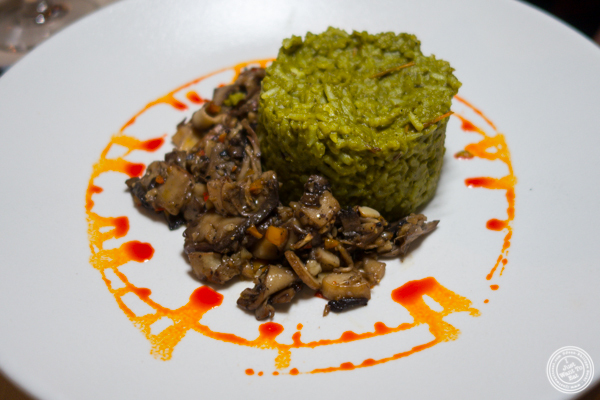 For her main, Jodi got the mushroom medley Khichdi, that was served with an asparagus puree and masoor dal. On my side, I went for the lamb, hesitating a bit with the tandoori squab. The three lamb chops were perfectly cooked medium, juicy and smothered in spices that had a very slight kick that let the meat shine. It was sitting on a mushroom purée that was delicious. With our entrées came some rice, yellow lentils (dal tadka) and black lentils (dal makhni), as well as some naan bread. The quantity of dal seemed small, especially considering it was very good, noticeably the dal makhni that was very creamy, but, finally, taking into account the rest of the meal, it was perfect as at the end I was full. The naan though was amazing: the butter naan was quite classic, but the cheese naan was incredible: it had so much cheese in it (there was gruyère cheese in it) that it was like an Indian grilled cheese rather than a bread to accompany your meal. It is a must have! For dessert, I went for the drunken Shahi Tukra, a saffron cake with Amrut rum. It was good, but I admit I was expecting a sort of Indian version of a baba au rhum that I love so much. Jodi ordered the Ma’s Rice pudding that I preferred, being nicely sweet with a nice crunch from the almonds. With the check, they brought us some pistachio chocolate biscuits that were very good, slightly crunchy. This as a great meal: the food was good as was the service, the staff making sure we enjoyed our dinner. Like Indian Accent, Junoon redefines Indian cuisine, elevating it to a level that truly deserves a Michelin Star. I definitely recommend this place. If you like this post, the photo or the blog, please feel free to share it or post a comment. Merci!